Liberty Coach's “Summer road show” yielding impressive sales results in 2015. So far this summer, sales have been closed on three coaches, and the groundwork has been laid for several more. Historically, summer rallies have proven to be one of the most popular venues for buying and selling coaches … and for good reason. 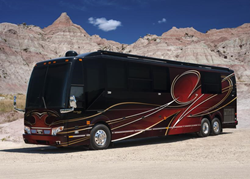 The 75th annual Sturgis motorcycle rally may not have cracked the million mark in attendance that many had forecast, but it more than met expectations for leading luxury motorcoach convertor Liberty Coach. That’s especially true in light of the fact that one of the coaches – the No. 798 2016 Ravello Triple Slide Edition – had not even been listed for sale yet, having been finished just days prior to the event. The sold units include a virtually brand new 2016 Fairfax Double-Slide (No. 797-A) as well as a mint condition 2014 Ravello Triple Slide (No. 801-A). It’s been particularly successful for 2015. So far this summer, sales have been closed on three coaches, and the groundwork has been laid for several more, Konigseder said. In the meantime, the “Liberty road show” is rolling full speed ahead, with several major events just added to the calendar and plenty of new and pre-owned coaches to show and sell! For more detailed information, including multiple interior and exterior photos and complete mechanical, electrical and automotive specifications of each coach, visit http://www.libertycoach.com/available-coaches.